The stage starts from yesterday’s finish city of Troyes, with the riders heading uphill for the first 100 kilometres of the stage. The rise in the road is nothing to be concerned about, with the elevation rising only 350 metres in those first 100 kilometres. After the 100 kilometres completed point, the riders will be upon the intermediate sprint point in the town of Chanceaux. More climbing is completed, before the riders drop down sharply with 75 kilometres to go in the stage, setting themselves up for the only classified climb on today’s route, the fourth category climb of the Cote D’Urcy. The climb is 2.5 kilometres long, with an average gradient of 4.2 per cent, however, has sections above 9 per cent. At the top of the climb the riders still have 66 kilometres on the day’s stage, with them being relatively straightforward. There is an initial gradual descent until the 50 kilometres to go point, before flat roads predominantly all the way to the finish. There may be one potential factor that the riders will need to take into consideration; the wind. On the race’s official website, race director Christian Prudhomme noted the potential for wind to be a major factor on today’s stage. The final loop of 40 kilometres will see the peloton battle it out in the sidewind and some teams will certainly make the best of it. Other than the potential wind, there are no real difficulties on the day’s stage, with the final fice kilometres being along a straight road all the way to the finish in the town of Nuits-Saint Georges. 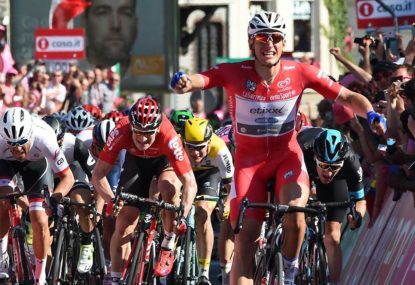 Yesterday, Kittel took the stage without any real lead out, having to come from around 10th wheel to take the win. If he gets a decent lead out, he should easily win again. Demare again kept his consistency, battling out for second with Griepel yesterday, as he continues to pick up valueable points to consolidate his lead in the green jersey classification.